New York Offers Free Cybersecurity Tools to Public to Deter Hackers - Integration Through Media ....! (VOA): New York City will offer free cybersecurity tools to the public as part of a new effort to improve online safety, officials said Thursday, a week after Atlanta was hit with a ransomware attack that knocked some municipal systems offline. The program, dubbed NYC Secure, will launch a free smartphone protection app to warn users when suspicious activity is detected on their devices, New York Mayor Bill de Blasio announced at a news conference. "New Yorkers aren't safe online. 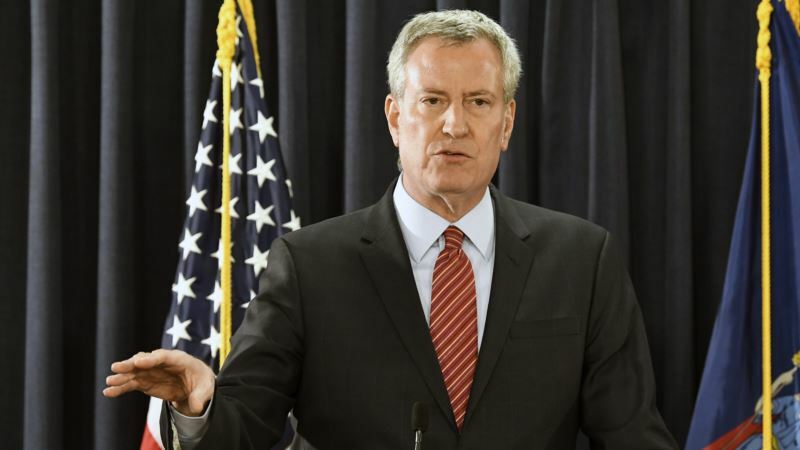 We can't wait around for other levels of government to do something about it or the private sector," de Blasio said. The program will cost the city about $5 million per year, he said. "It's our job in government to make sure that people are safe online. It's a new reality," de Blasio said. City agencies will also beef up security protection on public Wi-Fi networks by the end of the year to protect residents, workers and visitors. Those networks will be secured with a tool, dubbed Quad9, that is available to anybody in New York City and beyond at https://quad9.net. Quad9 routes a user's web traffic through servers that identify and block malicious sites and email. Atlanta cyberattack NYC Secure was unveiled as Atlanta officials worked alongside federal law enforcement and technicians from private security firms to investigate the cause of the attack that encrypted data on computers. Atlanta City Council President Felicia Moore said she was waiting to hear more about how the hackers breached city networks, the scope of the attack and when city services would be fully operational. "Everybody in the public wants to know. I want to know, too," Moore said at a news conference. "But I do think that we need to give them an opportunity to get the information." Atlanta on Thursday reactivated a website that allows residents to make requests for trash pickup, report traffic signal outages and ask for other public works-related services. Municipal court services remained offline Thursday and City Hall employees told Reuters their work computers were still unusable a week after the hack was detected.